In northern California, grape pickers work from sunup to sundown during the harvest. Temperatures can exceed 100 degrees. When they are not working in the vineyard, they labor in the vegetable field. Work is arduous, and living conditions are poor. Marcelo and Corazón Escarzaga, both ordained in Mexico, find their mission in rural churches near the vineyards. They minister in Tulare County, the poorest in California. 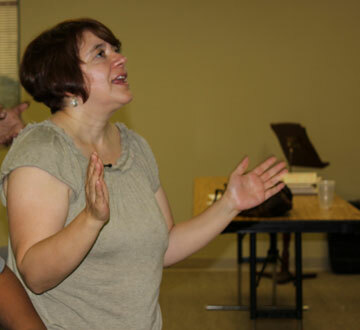 “It is a very rich experience for any pastor who wants to contextualize it, who wants to work with the field workers and pass through this experience,” says Corazón. The California-Nevada Annual (regional) Conference invited Marcelo and Corazón to plant churches in the Fresno District in California’s central valleys. In Mexico, Marcelo worked in urban churches. The parents of four young children never imagined serving in the field, but they responded to God’s call. Marcelo is pastor of the Church in Lindsay, and Corazón directs a ministry in Visalia. They have a third ministry in the city of Porterville. They invite local people to share food and to pray together. The pastors encourage their flock to save money for less prosperous times. Marcelo decided to work in the field for a while. The workers picked him up at 4 a.m. The first day he brought sunscreen, sunglasses and a sandwich. Twelve hours later, he returned home, exhausted. He realized the scope of the workers’ labor. the area. UMNS photos by Francisco M. Litardo. Marcelo also worked on “the ring.” This is a process where workers cut part of the trunk of the vine for the plant to retain nutrients. The workers quickly outpaced Marcelo. “I always ask them if they have a need and pray with them.” Marcelo says. He also runs along the vineyards carrying cold water bottles to distribute, talks with them and invites them to visit the church. The Escarzagas are a gift for the fieldworkers. On Thursdays, the couple always has plates of food for the workers. What most concerns the couple is domestic violence and lack of family support. Most migrant workers come from poor communities in Mexico and have little education. They do not come to study but to work in the fields. They aspire to improve their lives as farmers in the United States. Many do not know how to read or write. Mothers must leave their children in the hands of strangers. They can spend a little time with their children and provide basic food. The community of faith in Lindsay offers a food bank that distributes fruit, rice, noodles, oil and other necessities. In Visalia, people are more educated and prepared for other types of work. Many enjoy the benefits of a second and third generation as children of immigrants. They no longer work in the field. College is on their radar. Many are legal U.S. citizens, as opposed to the Lindsay ministry where many are undocumented. 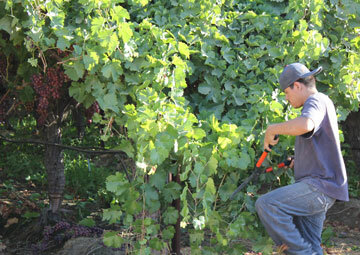 A migrant worker prunes grapevines in Poplar, Calif. The Porterville church offers Sunday school and two types of services. The entire Escarzaga family works with the ministry. Marcelo, ordained in Mexico, is pursuing a master of divinity degree at Fuller Theological Seminary in Pasadena, Calif. Marcelo and Corazón would like to continue the candidacy process in The United Methodist Church and become pastors in full connection. The Escarzagas believe God has called them to work in the fields of California. When Marcelo picked grapes with the workers, they were impressed. "Pastor, now you're one of us,” they told him. *Bachus is director of Spanish Resource Ministries at United Methodist Communications. News media contact: Amanda Bachus, Nashville, Tenn., (615) 742-5113 or newsdesk@umcom.org.